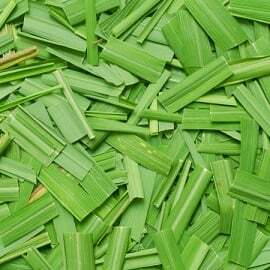 Palmarosa is a spreading wild grass which produces erect stems of up to 3 metres in height; it is native to India and Indochina, but is now cultivated in many other areas. The grass is harvested, before the flowers appear, and then allowed to fully dry prior to the essential oil being extracted via steam distillation. The grass occurs in two varieties, Motia and Sofia, which grow in different environments and altitudes; the Motia variety yields the better quality oil and finer aroma. Palmarosa essential oil has a sweet, floral, slightly dry scent with a hint of rose and is thin in consistency with a clear to pale yellow colour. Palmarosa essential oil seems to be helpful in reducing the temperature when the body is overheated. This may have a positive effect when suffering from a cold or flu, as it enhances its antiviral action, since bacteria is weakened in a cool environment. It has the ability to restore water balance and stimulates the natural secretion of sebum which will help those suffering from dry skin. It also helps skin regrowth by aiding cell regeneration, although its reputation for eradicating wrinkles has yet to be proven. Its antiseptic and bactericidal properties make it a very useful ingredient in preparation created for cuts and scrapes, and helps to protect wounds from becoming septic or infected. It acts as a tonic for the digestive system and can have a positive effect on intestinal problems. It stimulates the appetite, and could help those suffering from eating disorders as it appears to have such a positive effect on feelings. The properties of this oil, can also be felt on the mind; it’s calming yet uplifting effect on the emotions and its ability to refresh and clarify the mind can aid in relieving anxiety and stress. Palmarosa essential oil blends particularly well with Bergamot, Citronella, Geranium, Jasmine, Lavender, Lime, Melissa, Orange, Petitgrain, Rose, Rosewood, Sandalwood, Violet and Ylang Ylang. It can be used in burners and vaporisers to create a calming yet uplifting effect on the emotions. It is also said to be able to refresh and clarify the mind. In a bath or massage oil it can help to restore water balance, stimulate sebum production and aid skin cell regeneration. It also has effective antiviral, antibacterial and antiseptic properties and can be useful oil when suffering from cold and flu symptoms. In a cream or lotion, palmarosa essential oil restores water balance and stimulates the natural secretion of sebum, making it practically useful for those suffering with dry skin. It also aids with skin regrowth by aiding cell regeneration and general skin infections. Properties of palmarosa essential oil: Antiseptic, Antiviral, Bactericide, Cytophylactic and Febrifuge. Why do we use palmarosa essential oil: We use palmarosa essential oil for its skin regeneration and sebum stimulation properties, but benefit is also gained from its antiseptic and antibacterial properties. Where do we use palmarosa essential oil: We use palmarosa essential oil in our Natural handmade sweet orange and palmarosa soap and 100% pure palmarosa essential oil. Palmarosa essential oil has no inherent risk.